The HDA125 transforms your Teledyne LeCroy oscilloscope into the highest-performance, most flexible mixed-signal solution for high-speed digital debug and evaluation. With 12.5 GS/s digital sampling rate on 18 input channels, and the revolutionary QuickLink probing solution allowing seamless transitions from digital to high-bandwidth analog acquisitions, validation of challenging interfaces such as DDR4 has never been simpler or more comprehensive. T3DSO2000-MSO Программная опция логического анализатора, 16 каналов, для серии осциллографов АКИП-4126X. Для работы опции логического анализатора необходим логический пробник SPL2016. T3DSO1000-MSO Программная опция логического анализатора, 16 каналов. 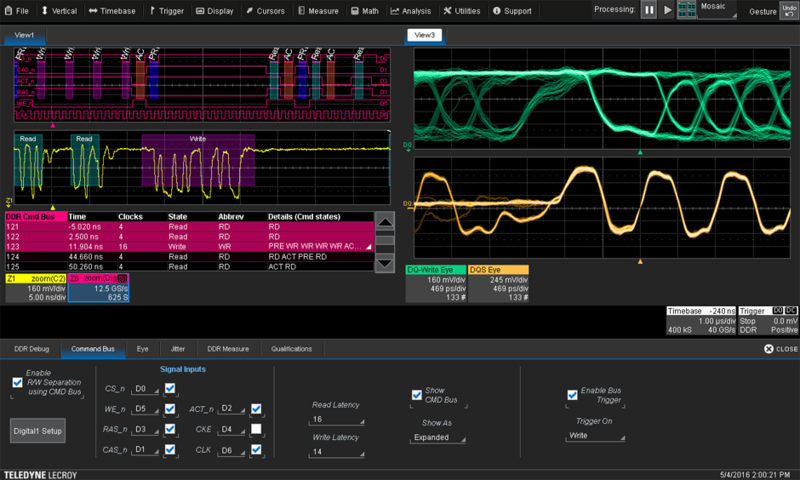 SYNC connection to LabMaster oscilloscopes: Create the highest-bandwidth mixed-signal solution available - up to 100 GHz analog bandwidth! The HDA125 samples 18 input signals at 12.5 GS/s, for accurate characterization of the fastest signals. But sample rate is only half the story - high-speed embedded systems testing often poses very challenging signal amplitude conditions. The High-speed Digital Analyzer meets these challenges with ultra-low probe loading and industry-leading sensitivity (150 mV minimum signal swing). The most precise threshold settings are ensured with a unique hysteresis adjustment capability, and three times better threshold accuracy than competing mixed-signal instruments. The QuickLink probe tip system was designed from the ground up to be compatible with both the HDA125 High-speed Digital Analyzer system, and with Teledyne LeCroy’s WaveLink series of differential analog probes. This cross-connection ability allows you to equip your system under test with QuickLink tips at all desired test points, and swap connections between digital and analog acquisition systems as needed. 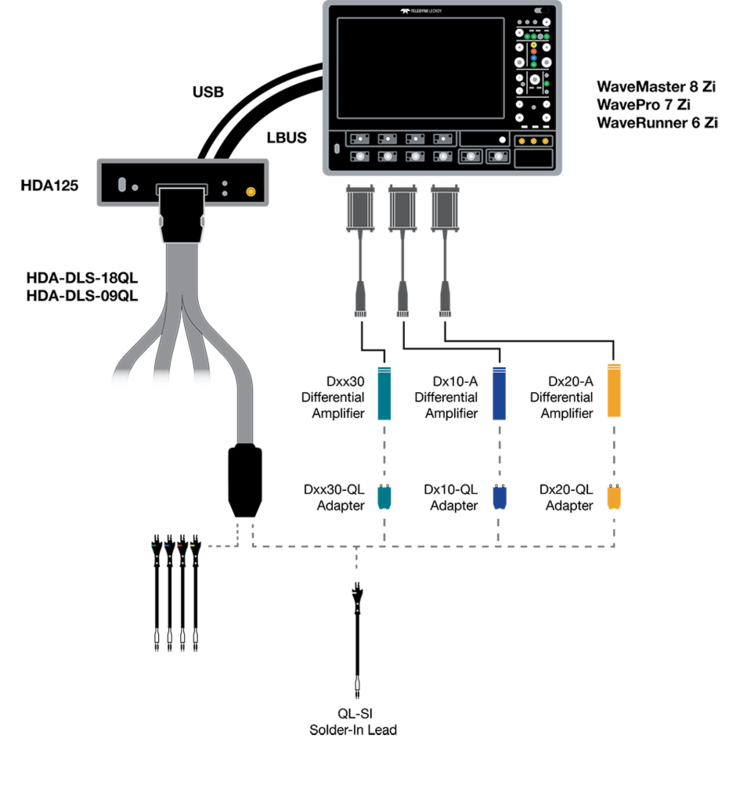 The HDA125 connects to Teledyne LeCroy oscilloscopes using an LBUS or ChannelSync interface, enabling the digital channels to be acquired with the same timebase accuracy and triggering synchronization as a built-in mixed-signal solution. A USB 3.1 interface provides high-speed transfer of the acquired digital data to the oscilloscope. And the modular design allows you to better leverage your investment by sharing digital acquisition capability between existing instruments. 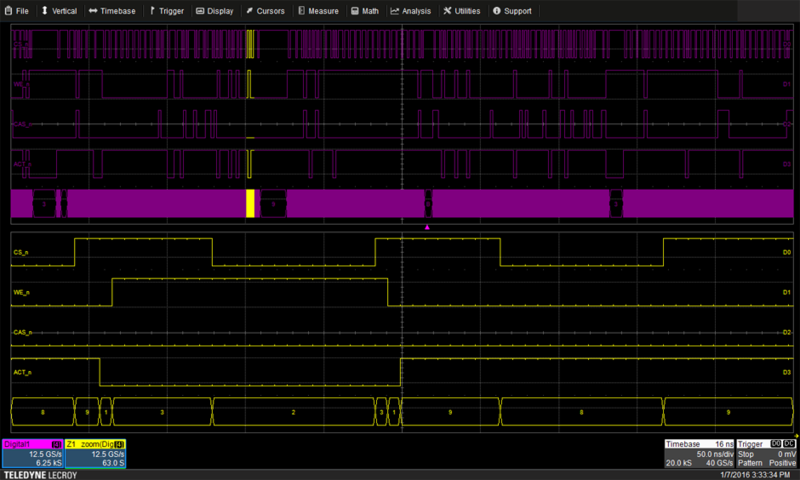 Basic debugging and validation of embedded DDR interfaces typically involves analysis of the analog properties of the clock, data (DQ) and strobe (DQS) signals - and Teledyne LeCroy’s DDR analysis tools are established industry leaders in this application. But when validation tasks become more complex and problems require deeper insight, the ability to trigger on, acquire and visualize the state of the DDR command bus is invaluable. The HDA125 brings command bus acquisition to Teledyne LeCroy’s already comprehensive toolset, providing the ultimate in memory bus analysis capability. 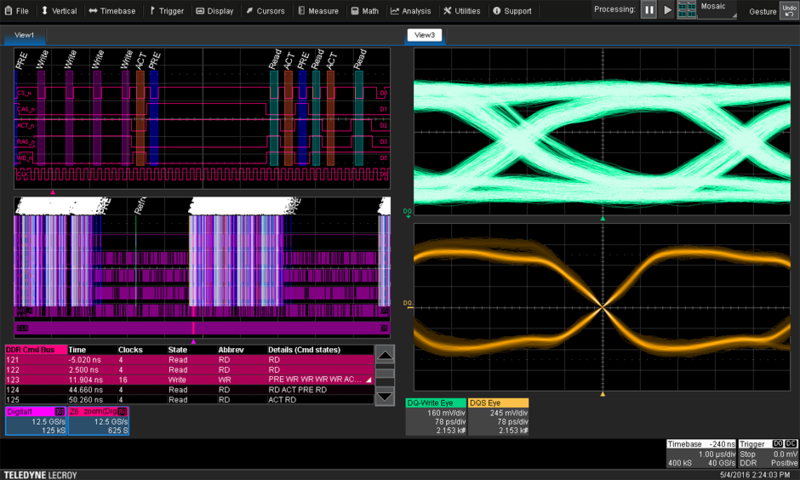 The HDA125 enables the unique “bus view” feature of the DDR Debug Toolkit, which brings Teledyne LeCroy’s advanced bus analysis feature set to bear on DDR analysis. View bus activity in tabular form, and move time-correlated views to a desired event with the touch of a button. Search for specific events and bus states within the acquired record. 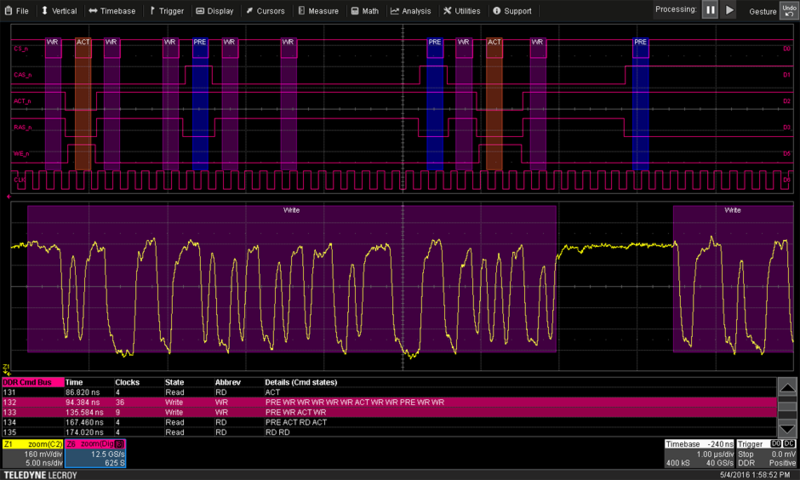 Intuitive color overlays and annotations make it easy to identify areas of interest in the acquired analog waveforms. The ability to trigger on specific states of the command bus becomes an invaluable tool for quick understanding of DDR signal quality. The HDA125’s logic triggering combines with the DDR Debug Toolkit's intuitive setup and intelligent software cross-triggering to provide the ultimate DDR triggering system. Persistence maps of read and write bursts provide an easy and fast means of identifying subtle signal-quality problems for further investigation.